Enter a virtual video game arena and take on your opponents until only one fighter remains! The game grid comes to life in front of you. A virtual war zone where other online Players are logging in to play the computer game, too. A quick check of your virtual fighter’s stats show you are currently equipped with the most basic of weapons and armor. Somewhere, out on the grid, are better weapons and better armor that will make your fighter stronger and deadlier. The problem is, all the other players know it, too, and they want the same thing. Readying your basic weapon, you watch the game start-clock tick down…3…2…1! Time to frag your opponents before they frag you! 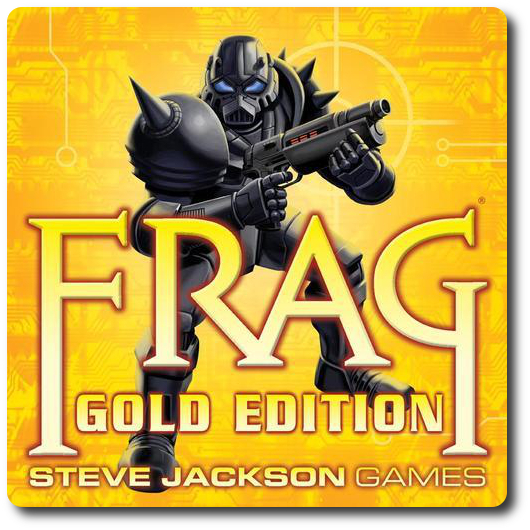 Frag Gold Edition, by Steve Jackson Games, is comprised of 1 game board (large and double-sided), 112 game cards (56 Gadget cards, 34 Weapon cards, and 22 Special cards), 35 Bullet counters, 20 Blood Splat counters, 20 Gun counters, 18 six-sided dice, 6 Fighter pawn, 6 Record Sheets, and 1 dry erase marker. All the game components are made of either solid plastic or thick card board. Our only negative comment regarding the game components is that it only includes 1 dry erase marker for 6 players. That’s some pretty shoddy math, folks. Do yourself a favor and download the free record sheet you can print off once and make unlimited copies off. The rules of the game also suggest you add extra six-sided dice and, of course, more dry erase markers. To set up the game, first unfold and place the game board in the middle of the playing area with the map you want to play on showing. The board comes with two maps and neither one is meant to represent a harder or easier level. Just a different landscape for the players to duck and dodge in. Second, pass to each player a Record Sheet and have them select a Fighter pawn in any color they choose. If using the provided dry erase Record Sheets, have the players match their Record Sheet color with their Fighter pawn color. Third, each player now designs their Fighter. Fighters have 3 stats. These are Health, Speed, and Accuracy. Health determines how well the Fighter resists damage and how many weapons they can use. Speed determines how fast the Fighter can move across the map and how far they can jump. Accuracy determines how accurate a Fighter’s attacks are and how fast they can attack. Each player is given a total 7 points to divide among these three stats anyway they decide. The only rule regarding point distribution is that no one stat can have less than 1 or more than 4 points assigned to it. Once decided, the players write down these values in their corresponding box on the Record Sheet. 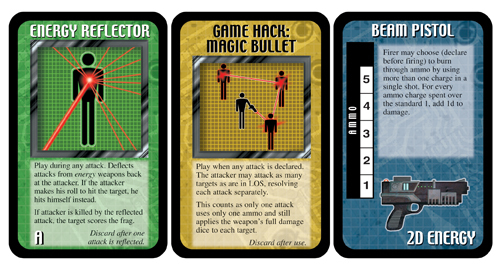 Fourth, separate the cards into three different decks, one deck per card type (Weapon, Gadget, and Special). Give each deck a good shuffle and then deal each player 1 card from each deck, face-down. Players should look at these cards but keep them hidden from their opponents at all times. Theses cards represent the Fighter’s starting equipment and options. The remaining decks should be placed to one side of the game board and kept face down to create draw decks. Fifth, place the counters in a pile nearby along with the dice. Sixth, have each player roll one of the dice. Re-roll any ties. The player with the highest roll goes first. Seventh, starting with the player who won the roll and going clockwise, each player will place their Fighter on one of the Respawn Points on the map. A Respawn Point is any square on the grid that has a number. Players need not cover the numbered spots in numerical order. The game is played in rounds with each player given a single turn per round. A player’s turn consists of 4 phases completed in sequential order. They are as follows. Death is not the end for virtual video game Fighters in this game. When they have suffered enough damage to be taken down, they respawn and keep playing until a single player wins the game. The player who owns the respawning Fighter rolls a single six-sided die and places their Fighter on the Respawn Point on the map that matches the number rolled. If the Respawn Point is currently occupied, the Fighter who is occupying it is automatically “bumped” to another Respawn Point by rolling a single die and placing their Fighter at the Respawn Point that matches the die roll. This can create a chain of bumps that is not resolved until all the Fighters are located on the map and no longer in danger of being bumped this turn. A player who respawns has their full stats, but none of their weapons. All they come back with is their basic pistol (the default weapon of all Fighters). A player can play their cards in their hand on the Fighter if they want to. Speaking of which, now is a good time to introduce the cards. Weapon Cards: these cards represent different weapons the Fighter can equip and are better than the default basic pistol. While the basic pistol has unlimited shots, the weapons do not. Most (not all) Weapon cards include a track that counts the ammo. A player can play one more Weapon card than their Fighter’s Health stat. For example, if the Fighter’s Health was “4”, the player could play up to 5 Weapon cards. For weapons that have ammo, players should use the Bullet counters to help keep track of how many shots they have left. Only weapons that are played to the Fighter are lost when the Fighter is fragged. Gadget Cards: these cards are also played out in front of the player and modify the Fighter’s armor, weapons, health, and movement. Some Gadget cards are a one time bonus and once played are discarded. Some Gadget cards remain in the game for a certain number of rounds or until the Fighter is fragged. There are no limits to the number of Gadget cards a player can play, but the card’s effectiveness is based on timing and the situation they are used in. Special Cards: these cards are rule breakers and can benefit the player who played them and sometimes they benefit all the players. If the player’s Fighter is not fragged, this phase can be skipped. The player now declares if they are using a teleport card (in which case, they reveal the teleport card from their hand) or they declare they are going to move. If they just move, the player takes a number of dice equal to their Fighter’s speed stat value and rolls them. Players can play any cards they like that modify the movement. The final number value is the maximum number of squares the Fighter can move this turn, but a player is never forced to move the total distance suggested by the final value. Movement is orthogonal, never diagonal. Fighters can move through other Fighters, but cannot end their movement or attack on the same space as another Fighter. If running isn’t your thing, the player’s Fighter can “jump”. How far a Fighter can jump is equal to the Fighter’s Speed stat value. A Speed stat value of “3”, for example, means the Fighter can jump 3 spaces. Jumping allows the Fighter to jump over everything but walls, costs double the movement points (a jump of “3”, for example, will cost “6” movement points), and is always done in a straight line like normal movement. Acid: walk or run through it, and the Fighter suffers damage. Doors: these are openings in walls that sometimes only allow a Fighter to go through them one way. Doors do not hinder movement or costs extra points to use. Grates: in the base game, these are just eye candy and have no effects. Teleporters: these squares automatically move the Fighter to an adjacent space for free or to any other teleporter square for 1 movement point. Walls: these are impenetrable and unjumpable objects. They stop weapons and movement, unless the player has a card that says otherwise. A player can attempt to power up their fighter if they move through or stop on a square that shows the same icon as a Weapon or Gadget card. When they do, they immediately roll a single six-sided die. On a rolled value of 4 – 6, the player draws the card that matches the icon the Fighter is standing on. A player can run over as many power up icons on the map as they like, but they can only check each individual square once per round. The player can also pick up the dropped weapons from fragged opponents or any weapon or gadget that was dropped by choice. If attacking an opponent’s Fighter, the player’s fighter must be in range of their target (as determined by the weapon). A player can attack a number of times equal to half of their Fighter’s Accuracy state value, rounded up. Only targets that are in line of site (not obstructed by anything on the map or behind walls or doors) can be put the in the player’s crosshairs. The player then declares their target and the weapon that is already in play they are going to use. The number of squares between the attacking player and the target are now counted. This is the range and the value that must be rolled or higher using a number of six-sided dice equal to the Fighter’s Accuracy stat. If the total sum rolled is higher than or equal to the range, the target is hit and damage is dealt, with the ammo being reduced for the weapon regardless of success. Damage is calculated by the attacker by rolling a number of dice equal to the weapon’s attack value and the target rolling a number of dice equal to their Fighter’s Health stat. The dice values are added and the total attack value is divided by the total defense value, discarding any remainders. The result is the number of points of Health the target loses. Armor can absorb some or all of the damage. Once the player has moved and attacked all the targets they want, their turn is over. A player must have five or fewer cards in their hand when their turn is completed. Players are welcome to play cards on their Fighter or discard them to reduce their hand size. Once completed, the next player going clockwise now begins their turn. “Frag” is a video game term that means defeating another player. This is the goal of the game and eventually every Fighter will take enough damage to drop their Health to zero or less. Once fragged, all the Fighter’s equipped Weapon cards are dropped, Gadget cards are discarded, and a Weapon counter is placed on the map square where the Fighter used to be standing, along with a Blood Splat counter. Another player can come by and pick up one Weapon card under the Weapon counter or the Blood Splatter counter. Not both or all the weapons. The Weapon card goes in the player’s hand, but the Blood Splatter goes on the Record Sheet and can be discarded later in the game to restore 1 point of Health. Any player who frags an opponent will automatically be rewarded by drawing a Special card and marking down a frag on their Record Sheet. The game continues until one player has recorded a total of 3 frags. Several game variants are available to the players that can be used to change the game play. Longer Game: the default win condition is 3 frags. For a longer game, increase the number of frags needed. Tournament Style: Frag Gold Edition can be played as a tournament. Winners of a game during tournament game play can improve one of their stats by 1. The maximum and minimum for the stats are still enforced. Even More: Steve Jackson Games has released a number of extras that can be downloaded and added to the base game for free. We found that the game was even more entertaining when we paired players together. This worked especially well when we paired up a Gamer Geek or a Parent Geek with a Child Geek. The game play was now about working together as a group and the Child Geeks always had a helper. This reduced the level of frustration that some of the Child Geeks were having and created an entirely new and interesting game play experience. The victory condition was still 3 frags, but it was now done by teams. When a team collected a shared frag count of 3, the game was over. We would sometime raise the required frags to 4 or 5 to make the games go a bit longer. This is also an excellent way to teach the game while playing the game. To learn more about Frag Gold Edition and read the full rules, visit the game’s web page. This has been one of those games on my review pile that my little geeks keep asking about, but have had to wait for. One game at a time, I keep telling them, but that hasn’t stopped them from opening up the box and looking at all the cards. Again, I cannot stress enough to those Parent Geeks looking to introduce the gaming hobby to their Child Geeks how important it is to simply get the game in the hands of children. If you keep games on a high shelf and out of reach, they just might start to resent the fact that Mom and Dad have a game they cannot play with. Unless the card art or subject matter is not appropriate for the little geeks, bringing the game down to simply look at is huge. It’s also a wonderful time to share and talk about the game without actually playing it. If the Child Geeks were noticeably excited about this game, the Parent Geeks were noticeably not. When I told them that we would be playing a board game that simulated first-person shooter video games, they were fairly “meh” about it. One Parent Geek said they were trying to avoid those types of video games altogether. I encouraged them to keep an open mind, answered all their questions regarding the level of simulated violence, and invited them to join in. By the time the Parent Geeks and I discussed the game in full, none of them were against trying it. The Gamer Geeks are already familiar with Frag (the original game). If they have not played the game, they’ve heard enough stories about it. This is where the Gamer Geeks somewhat split into two camps before the game was even scheduled to hit the table. For some Gamer Geeks, a light game of shooting and strafing sounds like a good time. For others, they’d rather spend their hours toiling away on a Euro-style game building farms and feeding civilizations. Either way, they are going to play the game, but I’ll do what I can to schedule Frag Gold Edition when downtime is needed between heavy games. So where does that leave us? Frag Gold Edition is a fairly straightforward game that has a lot of rules, but is easily played. Regardless if the player wants to be offensive or defensive in their strategy and tactics, it all comes down to who has the bigger gun. From a Child Geek’s perspective, this more or less boils down to rolling dice and counting squares. The Parent Geeks won’t have any issues with this game other than the game’s theme and the fact they are shooting at their little geeks’ characters. Gamer Geeks won’t have any issues and will most likely bad mouth each other while enjoying every minute of it. 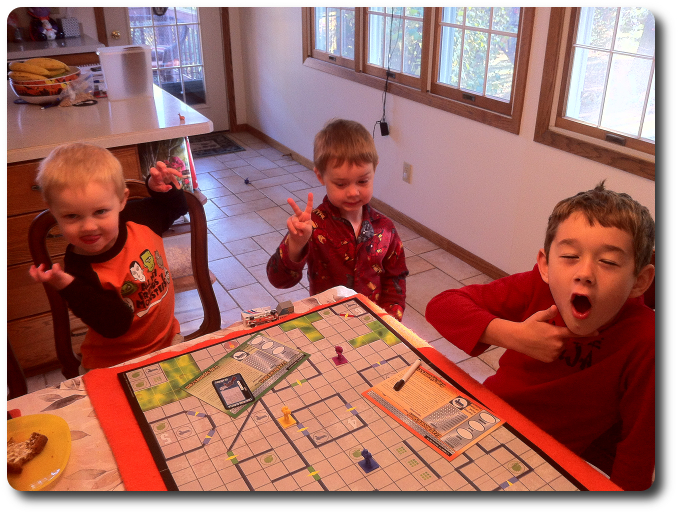 And so, as I set up the game for our first real playing session with my family, I asked my little geeks what they thought of the game so far. Note that my 5-year-old decided to play, but asked for assistance on all his cards. The game is too complex for him and requires a good deal of reading comprehension, but it is playable with assistance. We teamed up. My 8-year-old won’t have any issues and took on another team member to keep the game balanced. When the board was set and the Fighters placed, I turned to my little geeks and asked them for any last words they might want to share before we go to it. Excellent! Let’s see if this game keeps their attention or blows up in a big fiery cloud of disinterest. The Child Geeks were mixed about this game, but they never stopped playing. Their level of fun was highly influenced by their current standing and frag count. If they were taking out their opponents, they were having a wonderful time. If they were the target of aggression, they tended to mope, but still played to the best of their ability. Child Geeks as young as 8-years-old had no problem playing this game, but their strategy and tactics were more or less focused on running around and shooting at anything that moved. In other words, just what you’d expect. They often times ran out of ammo and put their Fighter in less than secure positions. They didn’t care one bit, however, and agreed that Frag Gold Edition was a good deal of fun. 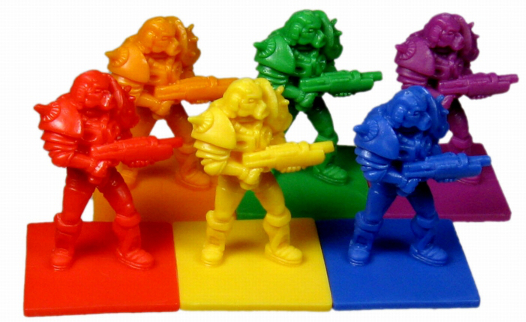 Especially when they took out Mom and Dad’s Fighters! Speaking of Mom and Dad, the Parent Geeks were not really sure what to make of this game. Their level of apprehension, and rightly so, was based on the fact that they had to be aggressive with their children. In Euro-style games, “aggression” is mostly done via the game board without direct player interaction. Not the case with Frag Gold Edition. When you shot at a Fighter on the board, the player who owns that Fighter is right there, looking at you, usually with a frown. Parent Geeks were concerned that their moves against their children would be seen as “being mean”. Which they were not. A few of the Child Geeks we played the game with did throw a fit sometimes when their Fighter was fragged, but quickly got over it. There is no “death” in this game and a player is quickly put right back in the action. Once the Parent Geeks saw that their Child Geeks weren’t taking the game too personally, they lightened up and started to have a lot of fun. Gamer Geeks enjoyed the game and all stated it was perfect for light game nights with a good-sized game group who didn’t want to play anything in particular. Frag Gold Edition, to them, is a “beer and pretzels” game, which means it plays light and casual, which just enough strategy and tactics to keep all the players engaged but never overtaxed. The level of smack talk at the table was directly proportional to the number of frags a player had collected. The more players they fragged, they more they strutted. Of course, that made them a huge target, but not a single player minded. Parent Geeks, you had hard time shooting at your little geeks until the little geeks started to mow you down with various weapons. After your peer group felt sufficiently “fragged”, you let loose and started to fight back. That’s when the Parent Geeks and the Child Geeks really started to have fun together. The game became even more entertaining when Parent and Child Geeks teamed up, allowing “team victories” versus just player versus player action. Do note, however, that some game sessions were sometimes put on pause to help a little geek work through disappointment, but this was seldom. As always, know what your little geeks are capable of handling emotionally. 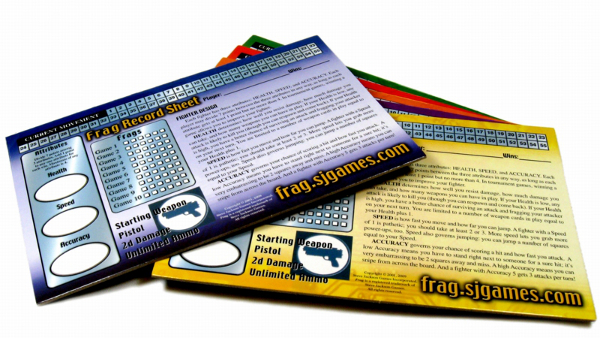 Among your peer group, Frag Gold Edition was also well received, as it plays light, is easy to teach, and is fast. It is also one of those games that you can temporarily walk away from and come back to without loosing any momentum. Much like the video games Frag Gold Edition was modeled after, the game can be paused and even restarted with little in the way of effort. Based on the fun level and ease of play, and despite the fact that the game requires players to be aggressive towards each other, Frag Gold Edition was approved. Child Geeks, Frag Gold Edition might just be one of those games you start to play at a young age and keep playing well into your venerable Gamer Geek years. The game is a classic and teaches a lot of the most basic of tactics and strategy when it comes to miniature wargames. You’ll be ducking and dodging, maneuvering and hiding from your foes as you attempt to collect bigger and better weapons. This game will also teach you humility and to focus on what’s most important in games, which is the fun and comradery you get at the table with the players. The game will challenge you emotionally at times, especially when it feels that you are being picked on, but don’t let any of this bother you, because everyone is a target. Based on your peer groups continued cheers and high-fives, this games was approved. Frag Gold Edition is not what I would initially consider a “family game”, but it works very well as such. The game is inviting to the Child Geeks because it is already designed to simulate video games and plays with light rules. For the Parent Geeks, because the game is light and their Child Geeks are eager to play it, it automatically becomes a winner. The game allows for team work, comradery, conversation, fun, and full-on nukes. 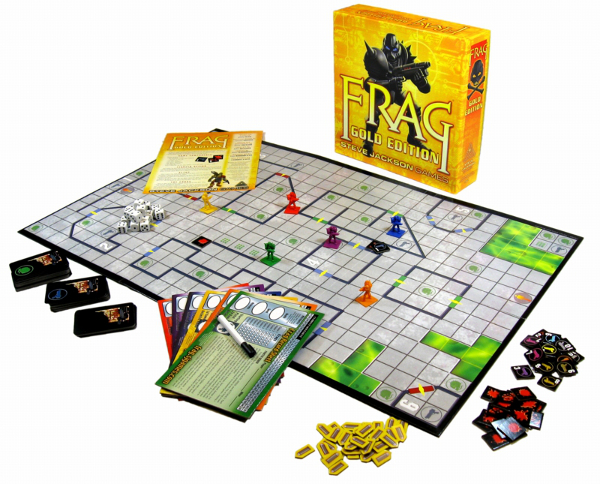 For those families who have teenagers, the game will play brilliantly, and anyone who is looking to introduce miniature wargames would do well to try Frag Gold Edition. Frag Gold Edition is still a lot of fun to play, despite it being somewhat over the top at times and downright silly when played with Gamer Geeks. But if a game continues to entertain and bring players together, it will always find its way to the table. If you are looking for a light game of strategy and tactics, where the weapons are ridiculously big but the game never feels bloated or weighted, then do take a look at Frag Gold Edition. It’s one of those strange games you’ll immediately recognize, be surprised you enjoy, and look forward to getting in front of your friends and family.